Have you guys gotten swept up in the subscription box frenzy yet?! A couple years ago, right when Birch Box first started, I jumped on the bandwagon and I loved it! It was only $10 a month and I got a cute little present delivered to my door! But eventually I actually grew tired of having so many samples laying around and cancelled it. And noooow while writing this post I'm thinking about how I kind of miss it? Its a weird weird place inside this brain. So during a snow day a couple weeks ago, a friend sent me a whole bunch that she thought were super cute! She was doing some research...on which ones she wanted to subscribe to...so I stole her suggestions! PS - this definitely isn't a sponsored post, just a fun one. i simply love is nowhere near that level (hello to my 6 readers!). 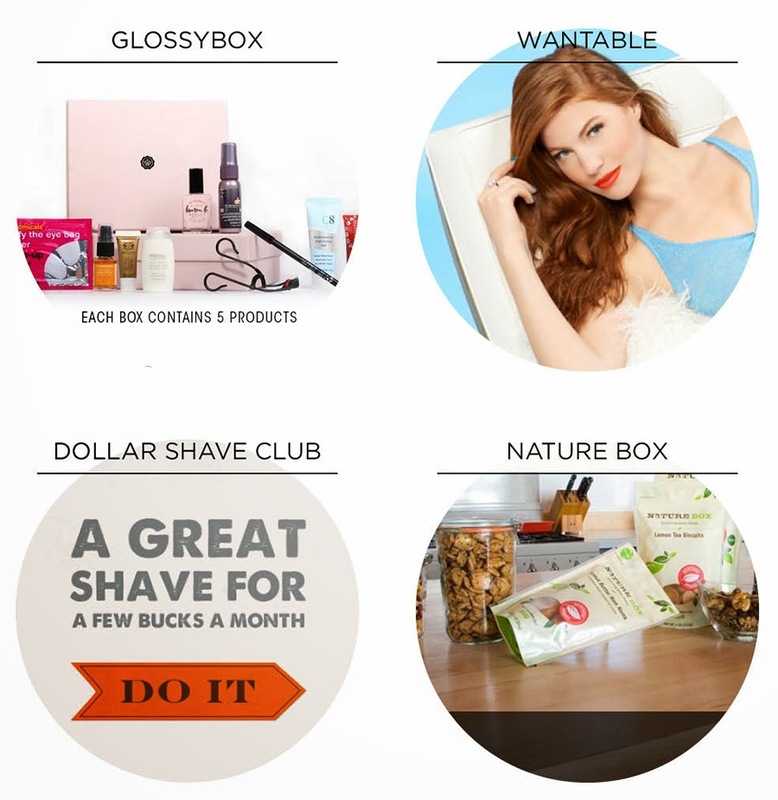 Glossybox is like a more upscale version of Birch Box, its more pricey, but the reviews are consistently high and you get more premium samples. Wantable Intimates Box sends you four undergarments, socks, adorable lingeries each month. How cute of an idea is that?! Dollar Shave Club will deliver razors to your guy each month and has the best video on their homepage. Just watch it and you will want to subscribe. Amazing. Nature Box is featured on Cup of Jo all the time and looks REALLY good. However, I just can't seem to justify spending that money on snacks...a girls gotta save up her ice cream money somehow.